Colorful butterfly tattoos like this one really stand out from other butterfly tattoo designs because they are so vibrant. In general, butterfly tattoos are inked with muted colors, most often in black and white. 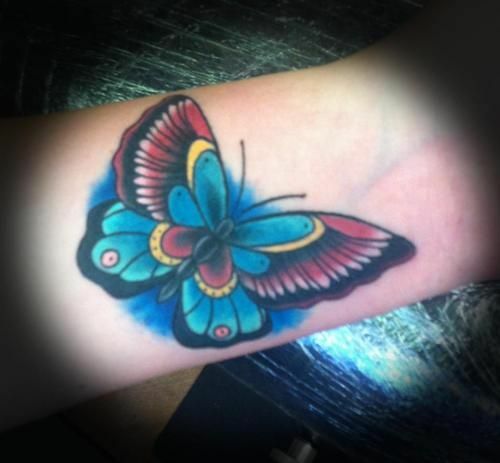 This butterfly tattoo in particular uses bright primary colors like blue, red and yellow to make a bold statement. The fact that this blue butterfly tattoo is inked on this girl’s forearm also makes it unique, because most butterfly tats for girls are located on the shoulder or lower back. As butterfly tattoos for girls become more and more popular, tattoo lovers are coming up with more unique and creative ways to express themselves and show their appreciation for the beautiful butterfly. There are few things in nature that compete with the grace of a butterfly, known for its perfect symmetry and brilliant colors.